My true love is the folk/psych/country scene of the late 60s and early 70s, but I haven’t really tackled much of it on this blog as of yet. However, I was listening to Tim Hardin tonight and figured that this is the time to usher in a series of posts devoted to the drug-addled and all-too sensitive souls who battled their demons in song. Tim Hardin springs to mind as my first post since his heroin habit cut short a career that should have wormed its way into more hearts and minds that it did. Tim Hardin definitely falls into the esteemed camp occupied by Fred Neil and Tim Buckley. His bluesy, soulful and psychedelic take on folk is just as moving and soul destroying as Howling Wolf and Robert Johnson. History places too much weight upon the classic bluesmen and ignores the emotional depths that the fucked up detritus of the hippy-dippy hedonism of the 60s.produced. To be sure, these singers draw from a wholly different pool of pain than Mississippi Fred McDowells or Robert Johnson, but the end result is just as devastating to my biased soul. One party suffered from oppression, poverty and a variety of social ills and the other were just fucked up and a bunch of soft-boiled eggs, but the pain and emoting is equally resonant in both camps. 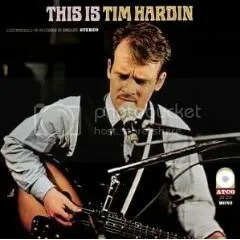 This is Tim Hardin is his second album and is mostly comprised of covers, but that doesn’t matter since tradition was the bread and butter of both parties. In light of his eventual overdose, his version of “Cocaine Bill” is especially poignant and heartbreaking in hindsight. His take on the tune is all too respectful as if he takes pride in the moments those late night mistakes where so much was ingested that self-destruction became romatnic. It is a paean to wrongdoing and the ignorance of consequence. Ignore the history of Tim Hardin and the subject material and it is sung as a love song to bad intentions. Peel away the context and This is Tim Hardin is a showcase for a voice that was one of the most disctinctive and versatile of the 60s folk artists. Put the skin back on that onion and it is a devastation prelude to a genius who whittled away at his tool until there was nothing left but an empty legacy.